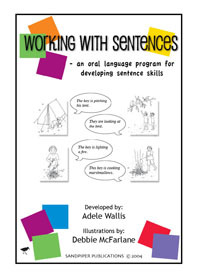 This resource focuses on the development of language, particularly at the sentence level. These activities are still set within the language framework of sounds - words - sentences - text. The sentence activities are not based specifically on grammar, as much as showing students the power and flexibility of sentence structure, in a metalinguistic approach. There are ten work units based around themes. Each lesson plan begins by establishing a vocabulary for the unit. Then a sentence 'main idea' is introduced with two or three activities to practise and demonstrate. Finally, vocabulary and sentences are used at the text level. An example of a sentence main idea is that a sentence is structured to present ideas, opinions and facts.